As I re-entered the Halloween scene in earnest, thanks to the growth of my young children (Silas, now 14, and Clara, 12), I was awed by the spring of candy knowledge that welled up inside me, from places deep in my subconscious. 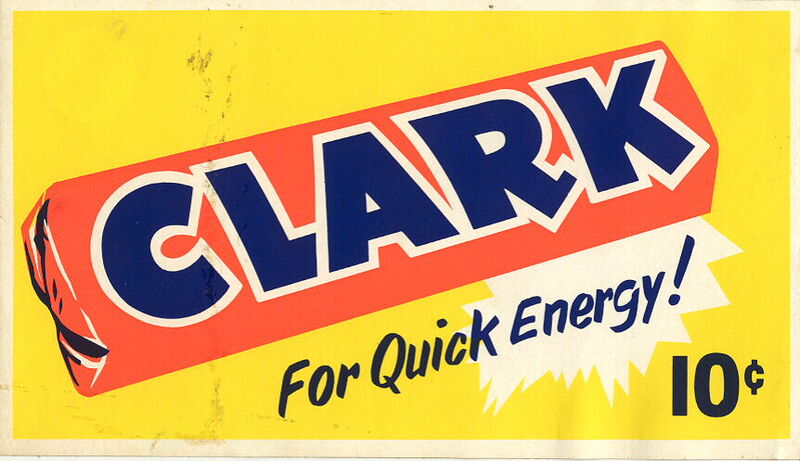 A few years back, when walking with my children Halloween night (and scamming as much candy as was reasonable for an adult), one couldn’t help but notice the surprising re-emergence of, for example, the Clark bar, that peanutty, soft-but-crunchy Butterfinger forebear. After plucking one from a neighbor’s bowl, I stood there on the street and stared wistfully at the little red package and nearly shed a tear — not because it was so very fun sized (an execrable euphemism; more on that later), but because I remembered a time when Clarks were “right there”, a legitimate option in the full-sized, 10-cent category at J&A’s in downtown Wellesley, Mass., circa 1974. No childhood is complete, after all, without a working knowledge of the Charleston Chew’s stupendous, metabolic duality. I bought all three (chocolate, strawberry and the ever-underrated Vanilla) and we shared a third of each. Then we went home, froze the remainders and, 40 minutes later (any sooner and the effect isn’t complete — the stuff you remember! ), we all experienced the crackling-hard but ultimately chewy, half-eaten Charleston Chew. Their first time! And I was there to witness this tri-lateral genius. I bought three more that week and figured I’d leave them on her doorstep, but the kids and I ate them instead. Thanks to me, I suppose, my children have developed a healthy appreciation, not just for candy, but for candy history. They really want to know what I enjoyed as a kid; I am duly transported and we’re all amazed at the volumes of my candy-related recall. 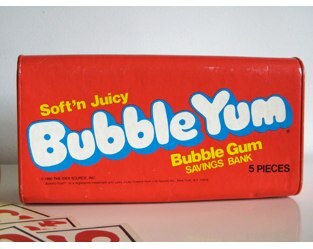 Bubble Yum was the source of mass hysteria among the pre-teen set upon its introduction in the mid-1970s. I don’t have war stories. This is all I’ve got to pass on to later generations. Another example of limited edition candy marketing, and a good one. Dark beats milk in almost every case. Keeping it all in perspective and not falling utterly prey to nostalgia, I tell them they’re fortunate to live in a time of unprecedented candy innovation, an era when most everything that was any good still lives (save the superb Milk Shake bar I coveted as a 6- and 7-year-old but haven’t seen since). What’s more, we live in an era when candy purveyors, in search of gimmicky limited-edition sales, apparently, have dreamed up some new and exciting twists on old favorites. Some fall flat, of course (the craven “Inside Out” Reese’s Cup), but have you checked out the dark-chocolate Kit Kat? Stunning. If you haven’t seen or dared try the Pina Colada Almond Joy (with white chocolate), please take my advice and get thee to a participating convenience store post haste. The irony here is that I’ve become, in my advanced age, something of a candy snob. Most mass-produced American milk chocolate tastes waxy to me, and I’m continually disappointed by the unpopularity of dark chocolate, which, in my view, is vastly superior on its own and would, if substituted for its milky cousin, improve almost any candy product you can name. Moreover, my mother passed on to me a love and appreciation for fine, pectin jelly beans. As a result I look down my nose at these newfangled “jelly bellies” with their foppish, speckled shells and their contrived flavors. Buttered popcorn indeed. What utter dross! But my candy past, especially as it rushes back to me in middle age, is almost completely middlebrow and unashamedly so. If I ate it as a kid, I’ll eat it now, with nearly the same abandon and ardor — though I draw the line at Jujubees and Chocolate Babies, the two candies my paternal grandfather always had on hand. Jujubees, you’ll recall, are horrible things, the concoction of some perverse confectioner whose sole contribution to the genre, it would appear, was an item that never gets stale because it starts out that way. Chocolate Babies? Does anyone even remember these things beside me and my siblings? They were vaguely Tootsie Rollish in taste and texture — and shaped like small, brown, human fetuses! Possibly the most grotesque candy product this side of Crunchy Frog. 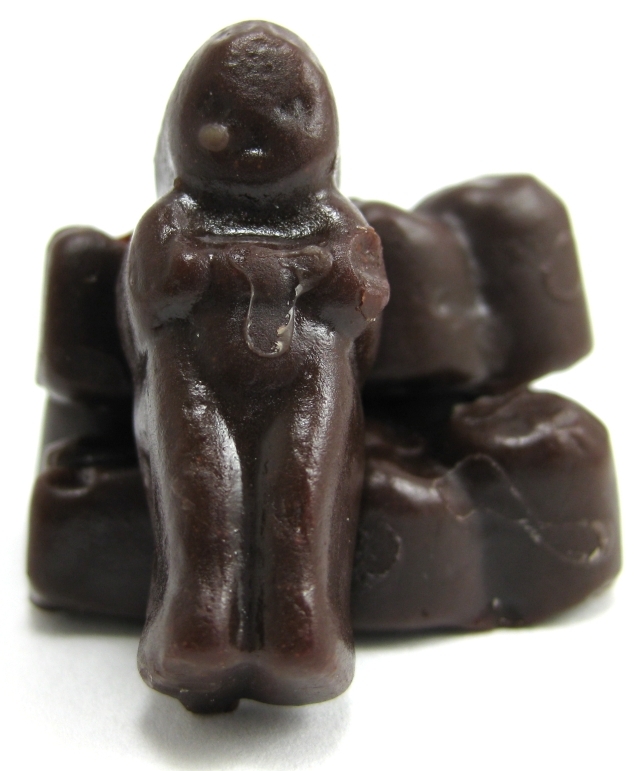 The inimitable Chocolate Babies: One has to wonder what Project Rescue would have to say about this, erm... confection. With little prompting, I think you’ll find that most adults have candy histories as wide-ranging as my own. Late on Halloween night one year, Silas and I arrived at our neighbor’s place for one final stop. Field and Suze had company but they kindly invited us in, promptly served Silas a piece of apple pie (to go along with the Snickers, Milky Ways and Three Musketeers they had on hand for the occasion), and poured me a glass of wine. We sat by the fire and conversation soon turned to the candy, as we all agreed that Three Musketeers was the most overrated candy bar on the planet. So boring. Salvageable only when frozen (the new limited edition mint version is actually an improvement). I offered that Milky Ways were only slightly more interesting, and isn’t it funny that the mere addition of peanuts can turn a worthless bar like Milky Way into the sublime tour de force that is a Snickers? Well, Field rejected my whole premise, maintaining there were great differences between the Milky Way and Snickers. No, I countered, a Snickers is merely a Milky Way with peanuts. He couldn’t accept this, and so proposed the only reasonable course of action: a side-by-side surgical procedure and examination of the candies in question. With great solemnity he proceeded to the front door, snagged both items from the bowl, unwrapped them, sliced them open and studied the evidence. Eventually I was proved correct. Never underestimate the transformative power of a peanut. 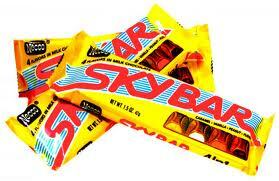 Sky Bar, a New England Candy Co. (or NECCO) product and probably its finest. Not hard to best the execrable NECCO wafer, however. Back in front of the fire we moved to other subjects of interest: The relatively recent introduction of the Snickers Ice Cream Bar, which reproduces the Snickers taste and integrates an ice cream element with genuine aplomb; the superb new Milky Way Dark, the answer to my prayers; and even the quirky, four-compartment Sky Bar, which has somehow survived into modern times. We agreed those Sky Bars now on shelves may well be the same ones we spurned as 10-year-olds. “Field tells me you’re a writer,” one of his guests remarked at one point. I’m all wistful now about “The Dime Store” – the five&dime where I took whatever change I could forage and bought candy. On my Schwinn Sting-Ray, of course. Particularly clear and fond memories include the introduction of the Marathon Bar (with a ruler printed on the back !) the Charleston Chew, as mentioned (though I might be inclined to add it to the list of over-rated candy bars)…and along with Jujubees I’ll add Necco wafers and the gum found in baseball cards to round out the top three of horribly stale and inedible candy. Actually that gum shouldn’t even be called a food product, let alone deemed candy. I reserve a special category for Boston Baked Beans. What the hell were those things ? I saw a huge box of them the other day. Like the size of a hardback book. Those tiny little boxes held plenty and were cool in a way that seemed retro even in 1974. I would very much like to see your mother bobbing for apples. Hal makes a common mistake here in his remembrance of the Staburst. Although I was about to agree with him that we were around for the introduction of the fruit chew, not so. It came out in the 1960s. Wikepedia this. I’d made the same mistake about Doritos recently. I thought I’d remembered them coming out. But nope. Also before our time. It’s a funny thing, this link between one’s own dawning self-awareness, and the emergence of favorite snacks. They don’t coincide as often as we think they do. But Hal is right about Bubble Yum. That was a big, honking deal in 1975. Clark bars, Baby Ruth, bring ’em on. Bring ’em all on (but only Good ‘n Plenty will do at the movies)! I was already a parent when Hot Wheels came on the scene. I got by with pretending rocks were cars. The glossier the rock the sexier the car. Our “race tracks” were rock-width paths in the dirt driveway. I lost a couple of baby teeth thanks to Sugar Babies, and my brother and his miscreant buddies used to shoot Jujubees at the movie screen at our local small-town theater. Those were the days. Vic: I was a Sugar Daddy sorta guy, but really, what was the difference? I can’t recall any. Only size and a stick… Did you know the guy who founded the John Birch Society (and first gave life to the crackpot world view now parroted up right-wing Tea Party nut jobs) owned the company that produced Sugar Daddies and Babies? It’s true, but I can’t hold it against the confection. I distinctly remember David Weir cornering the market on Bubble Yum soon after it came out then scapling his booty for a tidy profit at Hunnewell. It was the best of times it the worst of times. Well I had to go to the market anyway so I did a side by side. The nougat layer in the Snickers is thinner. I would say that this allows for the peanuts being added to an equal caramel layer. It is a warm tan in contrast to the cooler shade of brown in the Milky Ways (the “Y” stands for Why Bother). It’s flavor is decidedly peanutty while the MW’s is chocolatey. I don’t know what kind of wine you guys were drinking but the differences are stark. However, other than the addition of peanuts, the differences in the ingredient lists are subtle. See this is the problem with the internet. Someone can just put a total fallacy out there with no fact checking. Ah. Jujyfruits hardly rule. I think I last had them 12 years ago and only last week got the last bits out of my teeth.